So what's the fast food capital of Ireland then? A new study has come up with the Irish town with the greatest number of fast food outlets on average. A NEW STUDY has determined what the fast food capital of Ireland is by number of outlets per head of population. Take a bow Swords, north Co Dublin, for the winner is you. The town, population 36,924, in Dublin’s hinterland packs an impressive 0.24 greasy eateries for every 1,000 people, according to the study run by online health treatment site Treated. Swords is also the town with the most number of McDonalds, with one store for every 18,642 people. As you may notice the list is dominated by towns in the east of the country suggesting a greater predilection for food that isn’t good for you in the Pale area. 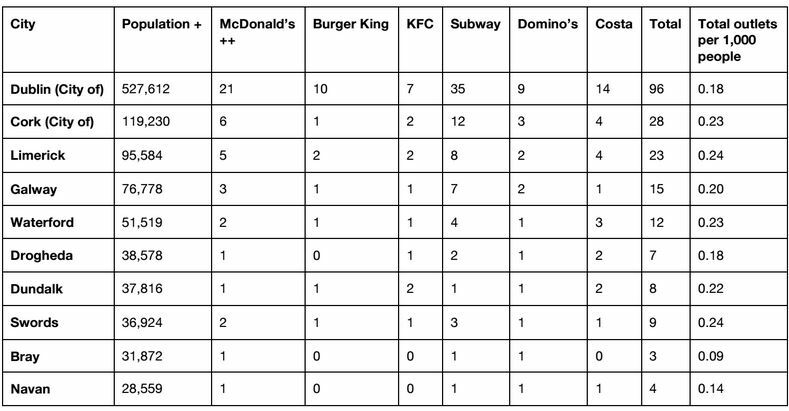 The outlets considered when compiling the study were McDonalds, Burger King, KFC, Subway, Dominos, and Costa. Dublin had, understandably given its greater population, the greatest number of outlets with 96. A good comparison for Swords topping the list is its number of outlets when compared to similarly sized east coast towns Navan and Bray. Despite having a very slightly greater population Swords has almost three times the number of fast food stores. Currently, obesity in Ireland, often associated with the consumption of convenience food, is higher than the European average. 66% of men here and 51% of women are considered overweight, while almost a quarter of the Irish population is considered obese. Is fast food predominantly to blame? “In most cases, it certainly isn’t at all healthier,” says Dr Wayne Osborne, GP with Treated. 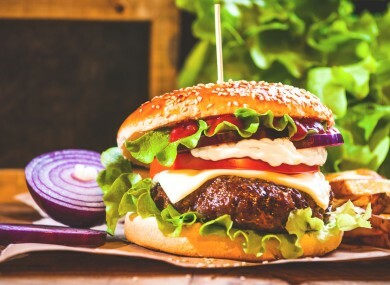 The products on offer are considerably higher in saturated fats, salt and sugar than the dishes you might cook at home, and it’s no secret that these are the main offenders when it comes rising cholesterol and blood pressure levels, as well as an increasing waistline. Planning and preparation are the keys to beating the fast food habit according to Osborne. “If you’re planning on being out for the day don’t leave the house on an empty stomach. Eat a good size, healthy breakfast or lunch at home,” he says. Similarly, don’t give a rough day at work a chance to sway you into buying comfort food. Make a sandwich or a salad at home in the morning, take it with you and keep it in the fridge. And if you’re planning on having something more substantial, prepare it at home the night before. Email “So what's the fast food capital of Ireland then?”. Feedback on “So what's the fast food capital of Ireland then?”.